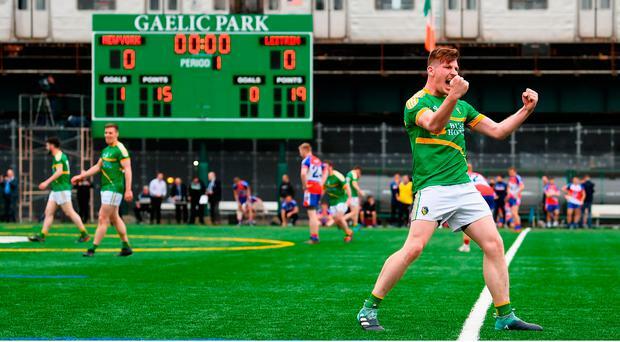 NOEL Plunkett was the hero of the hour in the Bronx as his last gasp point secured an extra time win for Leitrim in a packed Gaelic Park. New York looked set to win their first game in 20 attempts in the Connacht SFC when they led by three points in the second half of extra time. However, Leitrim pulled themselves level and Plunkett produced the winner in injury time. The Exiles worked one more chance to find an equaliser but David Freeman’s long range effort fell narrowly wide and, Leitrim, as they had done in 2003, escaped from the Bronx after extra-time. It was a suitably dramatic ending to a afternoon filled with excitement from the start. New York needed a big game from Jamie Clarke if they were going to turn the tide of history and while Leitrim opened the scoring through a Keith Beirne free after two minutes, the home side hit back immediately with a goal. Roscommon defender Neil Collins roamed forward and he found Clarke who fed Shane Hogan with a clever pass. The New York native didn’t hesitate in front of goal as he shot past Diarmuid McKenna to give his side a dream start. They followed that up with four points on the bounce with David Culhane, Clarke (2) and Neil Collins all finding their range. After ten minutes, Justin O’Halloran’s men led by 1-4 to 0-1. Leitrim looked shell shocked at this stage but as New York’s intensity fell, the visitors felt their way back into the game. Emlyn Mulligan, who hit 3-7 the last time he played in the Bronx, floated over a great point to settle their nerves. 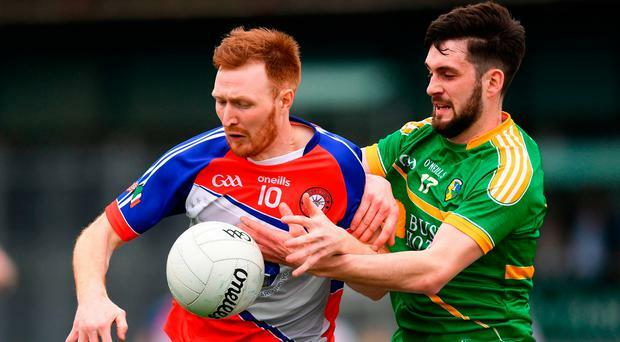 Aided by the introduction of Dean McGovern at midfield, Leitrim started to turn the screw and would kick eight of the next nine points that used them into the lead for the first time on 29 minutes. And while New York were struggling now, they still managed to manufacture a great goal chance. However, Dalton McDonagh’s hand pass to an unmarked Tony Donnelly was overhit and fell harmlessly wide. New York would manage one more attack and Clarke’s effort was initially singled as a point before that decision was over turned to leave the visitors leading by just the minimum at the break, 0-9 to 1-5, but with the momentum very much in their favour. New York improved in the second half but Leitrim kept in touch never levin the lead go beyond two points. O’Halloran’s side led by two points when Kevin O’Grady pointed on 64 minutes. However Leitrim got their noses in front when Shane Quinn pointed. Monaghan’s McKenna kept his nerve to point a free in injury time and New York might have made history when a chance fell to Clarke. However, his effort dropped short and shortly afterwards referee Derek O’Mahoney brought normal time to a close. Leitrim were on top in the first period of extra time but were their own worst enemies. They kicked four poor wides and dropped another point attempt short. New York kicked the only two points of the half. Clarke provided O’Grady with pass for a point before the Crossmaglen man curled over an excellent score to put his side two points up at half time in extra-time. Things got even better for them when they led by three in the second half of extra-time. However Leitrim fought back and Plunkett delivered the knock out blow to break New York hearts. SCORERS: Leitrim: K Beirne 0-7 (3f, 2 45), E Mulligan 0-3, R O’Rourke, S Quinn 0-2 each, M Plunkett, D McGovern, D Rooney, N Plunkett, A Flynn 0-1 each. New York: J Clarke 0-5 (2f), K O’Grady, T Donnelly (2f) 0-3 each, S Hogan 1-0, N Collins, D McKenna, L Kelly, D Culhane 0-1 each. Leitrim: D McKiernan; P Maguire, M McWeeney, O Madden; J Rooney, D Wrynn, S Quinn; M Plunkett, D Flynn; J Heslin, E Mulligan, R O’Rourke; D Rooney, K Beirne, B Gallagher SUBS: D McGovern for Flynn (21), R Kennedy for Heslin (52), C Gaffney for Rooney (58), D Rooney for Beirne (81). New York: V Cadden; N Collins, D Ward, M Creegan; E Williams, T Cunniffe, M Queenan; D Culhane, S Hogan; T Donnelly, J Clarke, L Kelly; K O’Grady, D McDonagh, D Freeman SUBS: D McKenna for Freeman (33), J Collins for Kelly (47), P Boyle for Queenan (52), A Cunningham for Donnelly (56), K Scally for Collins (61), JJ Matthews for Cunnigham (68BC), L Kelly for Culhane (81), T Donnelly for Matthews (85).